The Eurasier is a balanced, well-constructed, medium-sized Spitz (Spitzen) type dog with prick ears. It comes in different colors: fawn, red, wolf-grey, solid black, and black and tan. All color combinations are allowed, except for pure white, white patches, and liver color. 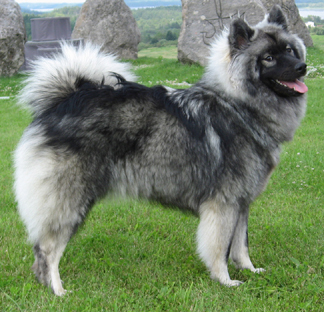 Federation Cynologique Internationale (FCI) standards call for the Eurasier to have a thick undercoat and medium-long, loosely lying guard hair all over the body, with a short coat on the muzzle, face, ears, and front legs. The tail and the back of the front legs (feathers) and hind legs (breeches) should be covered with long hair. The coat on the Eurasier neck should be slightly longer than on the body, but not forming a mane. The breed may have a pink, blue-black or spotted tongue. The male has a height of 52 to 60 cm (20-23.5 inches) at the withers and weighs approximately 23 to 32 kg (50-70 lb). The female has a height of 48 to 56 cm (19-22 inches) at the withers and weighs anywhere from 18 to 26 kg (40-57 lb).